February 14, 2019  Charles laid claim to the center of American popular music on these 1962 classics, and ended up with some of the brashest and best-selling music of his career. 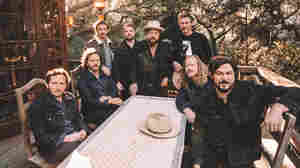 March 9, 2018  Rateliff and Night Sweats band member Mark Shusterman take us on a tour of their favorite music and the historical standouts that influenced them. 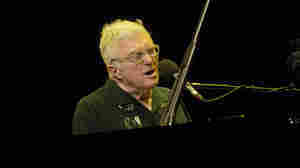 August 15, 2017  In this 2008 interview Randy Newman talks about his musical family, how Ray Charles has influenced his work over the years and what it was like hearing The Beatles for the first time. November 8, 2009  As a backup singer, Angela Workman was one of Weekend Edition host Liane Hansen's first music interviews. 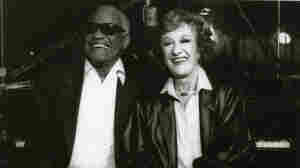 For Hansen's 20th anniversary show, Workman spoke about the legacy of Ray Charles, and what she's been up to since. October 4, 2006  A new album features the late Ray Charles playing with the Count Basie Orchestra, but Charles never actually recorded with the group. The tracks were mashed together by an audio engineer who used to play with Charles. June 18, 2005  Scott Simon talks with jazz guitarist John Scofield about his album That's What I Say, on which he plays the music of Ray Charles. November 27, 2004  The legendary music producer Phil Ramone's vast discography includes the likes of Bob Dylan, Stan Getz, Madonna, Billy Joel and Ray Charles. Ramone speaks with NPR's Scott Simon about his work. October 28, 2004  NPR's Alex Chadwick talks to filmmaker Taylor Hackford about his new movie Ray, a biographical feature about the life and music of Ray Charles. Jamie Foxx's performance as the legendary musician, who died last June of liver disease, is already generating Oscar buzz. October 4, 2004  Some of the biggest names in music joined Ray Charles for the late musician's final CD, Genius Loves Company. Hear longtime friend and keyboardist Billy Preston and album co-producer Phil Ramone talk about Ray Charles the man, his music and his lasting legacy. August 31, 2004  The CD that Ray Charles spent much of the last two years of his life working on is released. 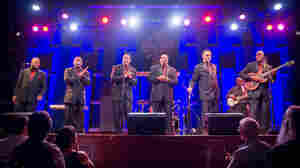 Called Genius Loves Company the CD features duets with Norah Jones, Van Morrison and BB King, among others. NPR's Tom Moon has a review. June 12, 2004  NPR's Scott Simon remembers Ray Charles, who died this week, with a musical selection. 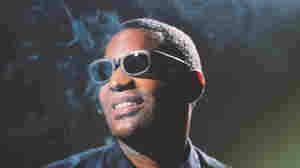 June 11, 2004  Bob French, a band leader and part-time radio disk jockey in New Orleans, La., talks about the Ray Charles songs he'll playing on his two-hour tribute show in honor of the late, legendary entertainer. June 13, 2004  Radio producer and commentator Paul Ingles offers an appreciation of rhythm & blues legend Ray Charles, who died this past Thursday. For Ingles, there's one song that towers above all others. June 10, 2004  Blues and gospel legend Ray Charles has died at the age of 73. Charles won the Grammy 12 times. His songs "Hit the Road, Jack," "What'd I Say" and "Georgia on My Mind" have become American classics. NPR's Felix Contreras offers an appreciation of the musician. June 11, 2004  American musical icon Ray Charles died of complications from liver disease Thursday at his Beverly Hills home. In a career that lasted more than half a century, Charles defied categorization and brought his soulful stylings to jazz, pop, country and R&B. September 11, 2002  Tavis Smiley speaks to Ray Charles about the events of Sept. 11, 2001 and about his version of the song America the Beautiful. August 1, 2002  Tavis Smiley interviews music legend Ray Charles about his new CD Thanks for Bringing Love Around Again. Charles talks about the album, his career and why after 50 years in the business, he still finds enjoyment in making music (10:18). 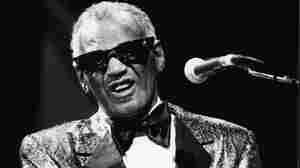 February 21, 2000  Long after he first improvised it on stage, Ray Charles still used his trademark song as an encore.